As the year comes to an end, I'd thought I'd take a moment to recap what's been happening here at Joyously Domestic in 2012, including a spotlight on some of my most-popular posts. And, I thought some of you may appreciate hearing a bit of the back story surrounding Joyously Domestic and taking a little peek at some of my "flops and failures." I started this blog in June of 2012 after creating and building a blog on a different hosting site for many months. I wasn't pleased with some of the limitations on the other site and decided to convert everything over to Blogger in June. I just celebrated my six-month "anniversary" here and am excited at how far the blog has come since my initial post. Blogging came very naturally to me. And, it has been a perfect fit. The last of our five children started kindergarten this year, so blogging has given me something to occupy my time while providing me an avenue to pursue something I am passionate about - food and family life. I had come to understand through much research that building and growing a blog - of any kind - takes much patience and lots of time. It doesn't happen overnight. Things were going along at a slow, but consistent pace from June through October. Around the beginning of October, I posted a recipe for Roasted Ranch Potatoes with Bacon and Cheese. Up until that point, Joyously Domestic had seen just over 10,000 visitors total in the few months since my first post. Almost instantly, things changed very quickly. Within the first month or two of the post, the roasted potatoes recipe had over 200,000 hits! Still to this day, it is pinned, shared and visited thousands of time each week. It drew in many new readers to the blog ... many of whom continue to frequent JD on a regular basis. By the way, it is a scrumptious looking dish, isn't it? In the midst of my successes in the kitchen while working on blog recipes, there have been many failures. Some recipes never "make the cut" and are still sitting in my drafts folder here on Blogger for possible revisions and "do-overs." Prime example: "Pull-Bread" recipes can be found all over Pinterest and many food blogs right now. 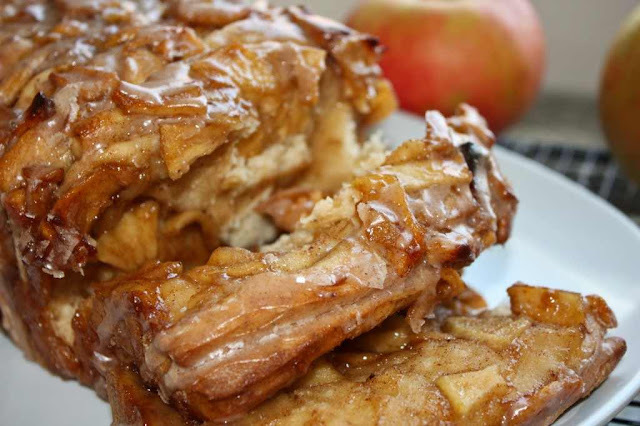 Here is a beautiful version of an apple cinnamon one from Java Cupcake. Isn't it gorgeous? Then, there was the time I was trying to make Seafoam Candy. My first go-round went awry when I used the wrong ingredient. Yes, folks, there is quite a difference in baking soda versus baking powder! Of course, I've learned some lessons when it comes to food photography, too. While I still have a long way to go (and still waiting to be able to purchase the camera of my dreams), I did learn the hard way not to take pics of food in orange bowls! Doesn't this just pierce your tender eyeballs? I thank God that I have children and a husband who are patient. They will tell you that they often eat meals lukewarm (or even cold) because getting the right photo of a dish can take lots of time and many, many "takes." My children know that when I'm taking food pics and I holler their name, it's probably because I need someone to hold the backdrop or a light at a certain angle. And, my hubby knows now that just because he may see me pull a dish out of the oven and declare that dinner is done, it's probably gonna be another 10 - 15 minutes before we eat because I have to stage and take pictures. Lots of them. 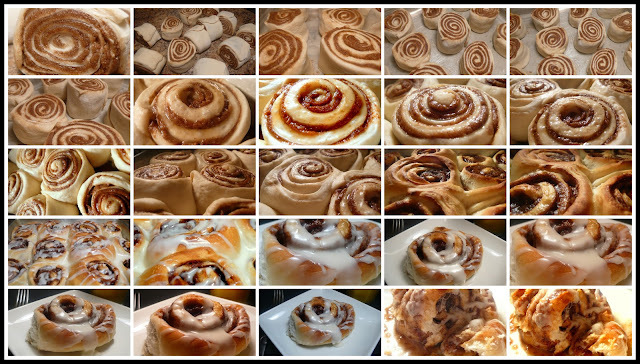 Here is an example of just twenty-five of the fifty-plus photos taken for my Ultimate Overnight Cinnamon Rolls. I usually take 50 - 60 photos of each recipe, but use less than a handful of them. Thankfully, computers have a recycle bin! Although my blog is mostly centered around food and recipes, the posts about parties and projects have been pretty popular, too. My two most-popular party posts were my Lego Party and Lalaloopsy Party. What has surprised me most about blogging is the people I've come to know and "meet." I greatly appreciate and cherish the connections I've made. I've had wonderful experiences with fellow food bloggers. So many of them share their knowledge of what works and what doesn't so willingly to those of us who are pretty new to the blogging world. They offer tutorials and answer questions so freely. And, then there are the readers ... those of you who have asked questions, given feedback, made suggestions, shared posts with everyone in your own circles and most of all, opened up about your own life to me. I thank you from the bottom of my heart for being so generous, kind and giving. Whether it be through contact here on the blog or through other channels like, email, Facebook or Pinterest ... I do love hearing from you all and I really try to give personal responses to each. As we look to 2013, I have lots of exciting things in the works. I just implemented a new PRINT THIS RECIPE button on Joyously Domestic and will be working to have that feature up and running on all of the past posts in the upcoming weeks. I am still continuing the idea of featuring a new blog header at the beginning of each month to reflect the holiday or season. There, also, are some GIVEAWAYS coming up ... I'll be sharing more on that very soon! I've been looking in to having some guest bloggers, as well, in 2013. And, something I am really excited about is a new Kids' Korner feature that will be debuting soon on JD. I thank you all for your support of Joyously Domestic and I look forward to a fabulous year ahead with you!